The Northview High FFA’s Food For America program has been named one of the top two programs in Florida. The local Food for America Program, sponsored the National FFA Organization and conducted by the Northview FFA in March, gave the students a chance to learn about agriculture firsthand as they got up close and personal with farm animals, farm equipment and more. About 800 elementary school students and 200 volunteers took part in the program. The program is designed to encourage FFA members to participate in Agricultural Literacy and Awareness projects on the local level. The awards were announced during the Sixth General Session of the 81st Florida FFA State Convention in Orlando. The Northview FFA has participated in the program for 14 years, placing second in the state two years ago. Northview has placed in the top five in the state for the last ten years. Both the Northview and Ernest Ward FFA chapters attended the FFA state convention last week in Orlando. The chapters traveled together and were able to enjoy the convention and other planned activities as a group. Individuals that attended from North Escambia were: Mark and Aimee Solari, Courtney Solari, Stephanie Solari, Allie Vidak, Brittany Thompson, Heather Kite, Lydia Weaver, Anna Donald, Cindy Wilson, Perry and Kay Byars, Andrea Byars, Shelby Lewis, Gavin Hinote, Micah Byars, Tyler Hester, Devon Bell and Nathan Waters. For a photo gallery of the FFA students in Orlando, click here. Click here for a complete NorthEscambia.com photo gallery with dozens of pictures from the May 20 event. Northview FFA chapter members began implementing Food For America planning in early fall of 2008 with a letter of notice to both invited schools and potential vendors letting them know of the date for the 2009 activity on campus. Committees were formed and in January the Northview FFA chapter sent letters of invitation to all of the elementary schools both Escambia County, and two surrounding counties in Alabama. We requested that all of the schools RSVP with the number of students they would be bringing. There were approximately 100 FFA members that participated in running this program along with 38 off campus exhibitors and over 800 invited guests. We had several attention grabbers including tractors, poultry, cattle, horses, an apiary display and a helicopter from the Florida Forestry Division. Other vendors consisted of Pine Ridge Farms, Walnut Hill Fire Department, Northview 4-H, Escambia River Electrical Cooperative, Natural Resource Conservation Service, University of Florida-Milton, Institute of Food and Agricultural Sciences, Young Farmers and Ranchers, Humane Society, North Escambia Bee Association and Stewart’s Grist Mill. The NHS-FFA members were tour guides for the elementary students. They were responsible for their group and escorted each class of students to the different exhibits. We also had a safety related puppet show, and a film on the importance of agriculture that students were able to watch while they consumed animal crackers and half pints of milk. Funds for the food were provided by Escambia County Farm Bureau. Coverage of this event consisted of three local newspapers: The Atmore Advance, Tri-City Ledger, and NorthEscambia.com. Pensacola WEAR Channel 3 was also in attendance and ran a package that night on the evening news of the day’s activities. 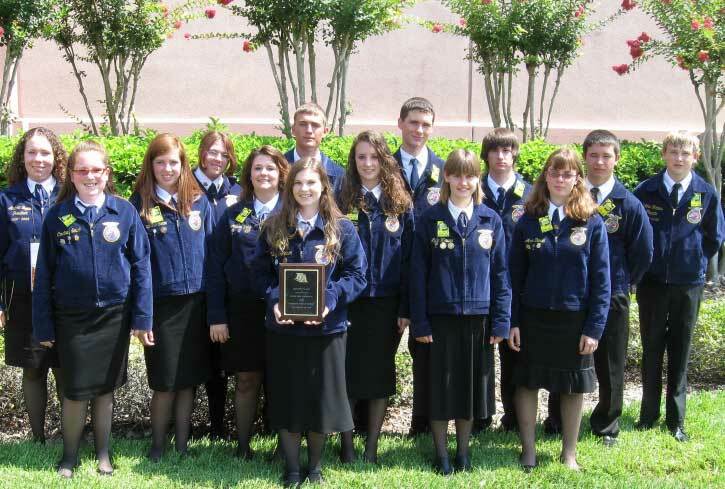 Pictured above: FFA students from Northview High and Ernest Ward Middle schools in Orlando. 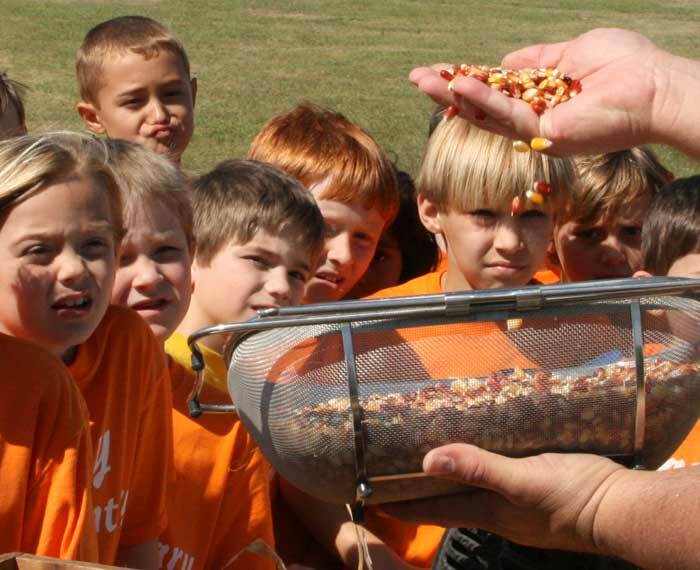 Pictured inset: Students learn about making corn meal at the NHS Food for America Program earlier this year. NorthEscambia.com photos, click to enlarge. i need a good activity fir food for america for the careers part. haveing a hard time finding one. A BIG thank you to all FFA members who helped to make it possible for us to qualify for the top ten and then win 2nd in State again. Keep it up Northview FFA. And another BIG thank you to Mr. Byars, Mrs. Wilson, Mrs. Perry and Mr. and Mrs. Weaver. Traveling to State Convention would not be possible without all of you! Great job!!!! we had a great time going down with this group of young people.Thank you Mr.Byars,Mrs.Kay and Mrs.Wilson for all that you do for this program!! !